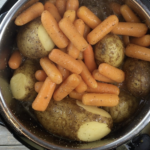 One thing I love about the Instant Pot Pressure Cooker, is that I can forget to put dinner in my slow cooker and still have something like Instant Pot Roast, Potatoes and Carrots ready within the next hour. The one thing I wished I did differently about this Instant Pot Roast recipe though, is that I wish I would have picked a less fatty piece of meat. Have you ever gotten talked into something because of the price? Well, I was shopping for the perfect piece of meat, when I found this one at only $2.99 per pound. I could’ve had a less fatty piece, but it was going to cost me $4.99 per pound. I wanted the cheap price, so I bought it, telling myself that the fat would disintegrate while cooking and I’ll just have a tasty piece of meat staring at me. Well, the tasty piece of meat part was true, but… I had to cut around lots of fat and gristle. None of it disintegrated! It would’ve been worth it to pay more so that I didn’t have to work around the fat, but we lived and the taste of the meat was still absolutely amazing! If you’ve not used a pressure cooker or Instant Pot before, but have it sitting on your shelf, this would be a great recipe to start with. Of course, you can still do this recipe in your slow cooker, instead of following my directions for the Instant Pot, if you don’t have a pressure cooker. Just assemble it all at the same time and cook it on low for 8 hours. OK, now, let’s talk about what we did for the recipe and the different steps you have to take with the Instant Pot. It took me a little while to feel comfortable sharing Instant Pot recipes with you, because I was uncomfortable with having to cook in steps. I wanted to throw it all in like I do a slow cooker. You CAN do that, but I don’t recommend it when there’s vegetables involved, otherwise they’ll be overcooked and mushy. I was once making chicken, broccoli and rice in my Instant Pot and ended up with green rice. The broccoli was so soft, it just stirred into the rice and you couldn’t even tell that there was ever broccoli there at all. So, my first step was to mix up the 3 packets of dressing/gravy mix. After that, I dipped each side of my roast into the mixes. If you want to see how I did this, watch the video down right above the printable recipe. Next, I placed the roast into the Instant Pot and tossed any excess seasoning over the top. After I was done, I poured 1/2 cup of beef broth over the top and placed the lid on the top, and shut the valve. I began by cooking it on Manual, High Pressure, for 35 minutes. After the 35 minutes was up, I added the potatoes and carrots to the pot and cooked it for another 19 minutes on Manual, High Pressure. I had originally wondered if this would be too long for the carrots, but amazingly enough, the carrots handled it perfectly. 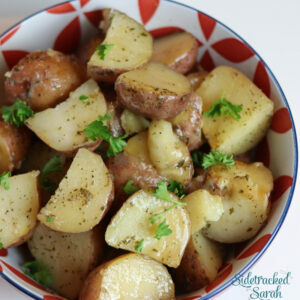 We LOVE Instant Pot potatoes because they’re always the perfect consistency and so tasty. I often don’t even peal them, because it’s faster that way. The skins slide right off after cooking, so that makes it all the more worth it. Of course, as you can see in this picture, I did cut some bad spots off. After the 19 more minutes of vegetables was done cooking, I quick released the pressure, and served up each plate. Then it was time to eat. And eat, we did! Please take a minute to view and share this recipe video, all about how to make Instant Pot Roast. This Pot Roast is delicious made in the Instant Pot pressure cooker! Place in slow cooker & add beef broth. Cook in Instant Pot or other Pressure Cooker for 35 minutes on Manual, high pressure. Quick Release the steam, by moving the valve to venting. Cook an additional 20 minutes on Manual, high pressure. Optional: For gravy, Take out meat and vegetables. Turn Instant Pot to Saute. Mix 2 Tbsp flour with 3 Tbsp water for each cup of pan juice. Turn on Saute & stir until it has thickened. Serve over roast and/or potatoes. You can also cook this meal in the slow cooker. Place all ingredients in slow cooker and cook on low for 7-8 hours. I made something like this in the crockpot … can’t wait to try it in my pressure cooker!! !